Most of our academic publications registered in HAL are listed below. Some other contributions, made in more open journals or forums, as well as in the Press, can be accessed from our personal Web pages, or from the Technical Blog of Dice. C3PO: A Network and Application Framework for Spontaneous and Ephemeral Social Networks. Qu’est-ce que l’intermédiation algorithmique ? Extending dataflow programs for guaranteed throughput. The stakes of Big Data in the IT industry: China as the next global challenger? 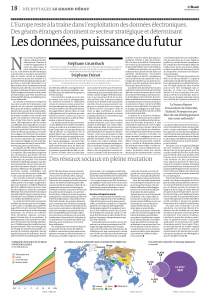 Our views in French have been exposed in the following tribune in the French daily Le Monde.